How to convert JPG images to PDF ? The JPG to PDF converter enables you to convert multiple images to a single PDF (JPG, PNG, GIF supported). Drag the file by dragging the handle on the left of the filename to where you want it to be. Use the up/down arrows on the right to move each file around. When the order is as you want it, click "JPG to PDF" to go ahead and perform the conversion. You will then be redirected to the download page where you can download the PDF once it has been processed. Simply click on Download to download the file. Note that you need to be logged in with an account to be able to download files. If you do not have an account, you can sign up for one and download your file right away. Note that if you want to pass files between our services, e.g. if you want to compress the PDF before sending to a colleague, then you can use our Workflows feature (Send to). It also enables saving files into the cloud via Google Drive/Dropbox and emailing files. See more in the related Workflows article. Once you are done, you can click "PDF Tools" to navigate to another of our tools, or to go back to JPG to PDF simply click the JPG to PDF link. If there was something wrong and you need to change something, you can use the "Do over" button. 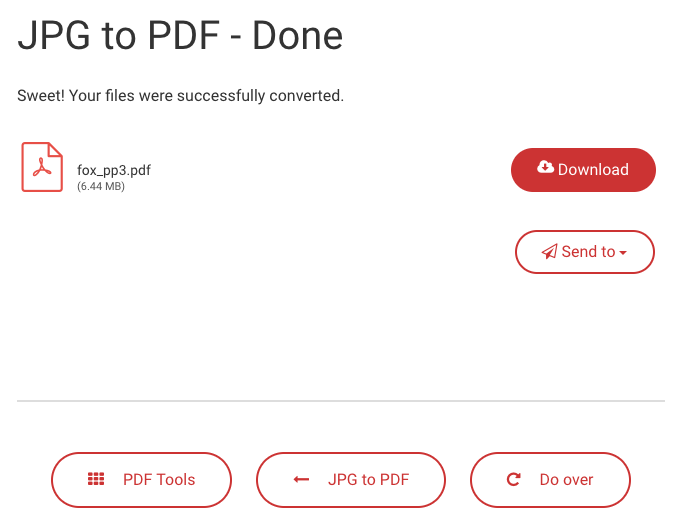 It brings you back to JPG to PDF but keeps all the uploaded files in tact, so you can add more files or change the order.